Examples: text-heavy books, such as Novels and nonfiction. 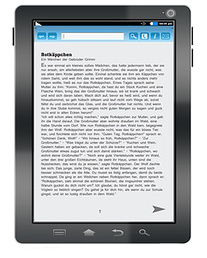 To make your ebook compatible with as many readers as possible, we convert your ebook in the above mentioned standard formats ePUB or MOBI. For the conversion and creation of your ebook we require the manuscript including all graphics in a word processing program (Word, images, such as the Cover as JPG or PDF). This offer includes minor changes in the final document (major changes will be charged extra).